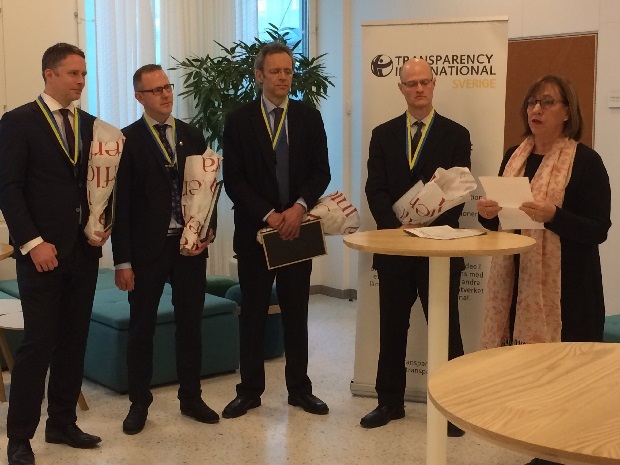 Four medical doctors received Transparency International Sweden’s Whistleblower of the Year (“Årets Visselpipa”) award earlier this month for speaking up against the gross ethical misconduct of a celebrated surgeon whose organ transplants turned out to be fatal. Whistleblowers provide a great service to society. The case of the Swedish doctors is a good example of why those who have the courage to speak out should be protected and celebrated: whistleblowers save lives. Dr Paolo Macchiarini, formally of the world-renowned Karolinska Institute (KI), which is responsible for awarding the Nobel Prize in Physiology and Medicine, was once considered a superstar. He became world famous for performing the world’s first synthetic organ transplants with stem cell covered artificial windpipes. He claimed the surgeries were successful, but they had devastating consequences: six out of the eight patients who underwent his trachea transplant surgery died and one has been in intensive care since the procedure. It was thanks to four fellow doctors from the Institute – Karl-Henrik Grinnemo, Matthias Corbascio, Thomas Fux and Oscar Simonson – that the case came to light in the first place. The celebrity doctor, who once claimed to have been the “personal doctor” of Pope Francis, was finally dismissed last month from Karolinska. The reasons? Scientific negligence, falsifying research findings, conducting experimental surgeries without ethical approval, providing false information in his CV, and to his patients – many of whom paid with their lives. The case shows how hard it can be for whistleblowers to be heard. When the four doctors first raised concerns about Dr. Macchiarini in 2014, there was an internal investigation that found evidence of misconduct, but the Institute did nothing. Instead – as often happens in the case of whistle-blowers – the doctors who raised concerns and requested the investigation were threatened with police reporting and dismissal from their positions. It took more than a year for the Institute to act. The vice-chancellor, who had earlier cleared Dr Macchiarini of the charges, finally resigned in February 2016 and Dr Macchiarini himself was dismissed a month later. Whistleblowers acting in the public interest deserved to be celebrated. “The four doctors reported severe research misconduct at the Karolinska Institute already in 2014. By doing so, they put their own careers at risk” – read the reasoning of TI Sweden for the award. “We are very grateful and happy for the award. But the patients and their families have not yet received a formal explanation and apology from the Karolinska Institute. We will continue our work on this matter. Indeed, whistleblowers often risk their reputations and their jobs when they speak up. That is why Transparency International chapters around the world celebrate them and advocate for strong whistleblower protection laws, based on TI’s international principles for whistleblower legislation. This week Transparency International is supporting Antoine Deltour, who is facing trial for revealing the secret deals that many multinational corporations had with the Duchy of Luxembourg to reduce their international tax liabilities. His disclosures in the public interest are changing tax laws to make them more equitable.